Devotional Chant artist and teacher, Brenda McMorrow invites you to join her in taking a deep dive into everything Kirtan (a practice of Bhakti Yoga). 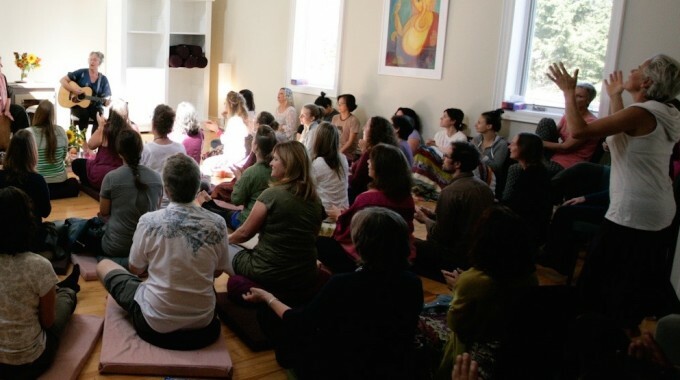 Whether you have a desire to lead Kirtan, incorporate chant into your yoga practice or teachings, or simply receive its benefits in your own life, this immersion will guide you toward these goals. At its most basic and universal level, Bhakti can be defined as an expression of love or devotion. Anyone who has experienced the spontaneous heart-expandingeffects of chant understands that the Bhakti Bhav (mood) is a sweet, pure and expansive feeling not easily described in words. Like our physical yoga practice, devotional chanting has the power to create healing shiftsin the body, mind and Spirit. Acting like a tuning fork for the entire system, chanting can help us clear blocked energy and open us up to the Universal frequency of compassion, expansion, trust, and love. Experience the benefits of mantra repetition as applied to chanting and meditation, and learn common Sanskrit & yogic chants and their meanings. Participants will gain insight into traditional deities, stories, myths and practices, and their application to our modern lives. Learn about the typical instruments used for Kirtan, and explore creative chant composition and kirtan leading in ensembles at your own comfort level. No musical ability and/or training is required for this program, as all students will have opportunities to nurture their own unique chanting voice in a supportive atmosphere of like-hearted others. Brenda’s personal stories, humor and revelations from her own path and worldwide travels light up these six days of brilliant Bhakti bliss!